Bronze Age Classic from 1974 featuring the first appearance of Kragonn. Written by Gerry Conway, Penciled by Big John Buscema and inked by Mike Esposito. Lease note that Original Art Pages are unique one of a kind collectibles. Demand has been increasing and prices have been rising steadily. 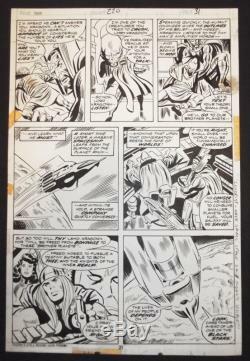 The item "John Buscema Thor issue 220 page 31 First Appearance Kragonn" is in sale since Tuesday, April 18, 2017. This item is in the category "Collectibles\Comics\Original Comic Art\Interior Pages". The seller is "atomiki" and is located in Farrell, Pennsylvania. This item can be shipped to United States.